Sicily is a triangular-shaped island made famous by a fiery volcano, Mount Etna. It is a land of extremes and also known for its now declining mafioso connections. It has got beautiful beaches, hilltop villages and spectacular cities. Getting around using car rental is one of the best forms of transport so that tourists can explore at their own leisure. Tourism has taken off in a big way which has led to a rise in the number of hotels, restaurants, shops and tourist information offices. Mount Etna is probably the most famous tourist site. It is an active volcano and offers the very best view of this island. The beaches are another hit amongst the tourists. The favourites are Giardini Naxos (with views of Mount Etna), Marina di Ragusa (south), San Vito lo Capo (north-west) and Vendicari (south). Make it easier to visit more than one of the beaches by using Sicily car hire services. Palermo is the island’s capital. 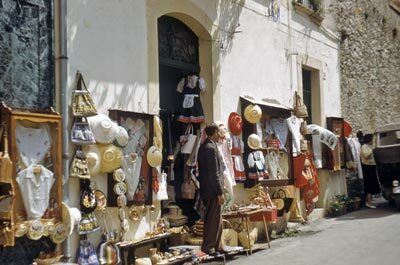 It has many historical sites and the best can be found within the Old Palermo district. Theatre-lovers can check out the Teatro Massimo on the Piazza Giuseppe Verdi and the TeatroPoliteama Garibaldi on the Piazza RuggeroSettimo. Palermo houses some of the island's best museums, one of the the most important being the Regional Archaeological Museum. There are numerous archaeological sites like the Syracuse Archaeological Park, which is situated on the south-eastern side of the island and very easy to reach for those who have opted for car rental. The Capuchin Catacombs hold the remains of thousands of Palermo inhabitants. Those with a strong constitution can see the dressed-up embalmed bodies of regular folk hanging around inside the tunnels. Erice is a spectacular and charming medieval town located high up in the mountains of western Sicily. It provides a beautiful view over the coast. Cefalu is a small fishing village which lies on the northern coastline of Sicily and is also worth a visit for those who want to see the traditional side of island life. Madonie Regional Park is situated on the Tyrrhenian coast. It lies between Cefalu and Palermo. Catania is the second city of Sicily and it boasts the majestic Mount Etna as its backdrop. The Ionian Coast is one of the most popular tourist destinations in Sicily and comes with many budget hotels and attractions. Alternatively, tourists can head to Messina which is the third-biggest city on the island and has many attractions. It lies on the Ionian Coast and can be easily reached with car hire. The attractions of Sicily are too numerous to mention them all, but when you visit, choose car rental and give yourself the opportunity to take in as much of the island as possible. Most major car rental agents in Sicily offer one way rentals. One-way rental is when you collect the car in one place and return the car in another location. In most cases the car rental agent will charge an extra fee if you wish to return the vehicle at a different location. In the terms and conditions will state if the one-way fee is included in the rental price. If the one-way charge is not included in the rental price, the one way charge needs to be paid on arrival directly to the car rental agent. Last month, the average car rental length in Sicily was 6 days. The average rental car length in Sicily is 4 days. The most booked rental car type currently in Sicily is ECONOMY cars. Last year, the most booked rental car type in Sicily were MINI cars. How much does it cost to rent a car in Sicily? Last month, the average car rental price was 198 USD. Last year, how much did it cost to rent a car in Sicily? Last year, the average car rental price was 51 USD. What is the current average daily price to rent a in Sicily? Last month, the average rental price was 36 USD per day. How much did it cost to rent a car in Sicily over the past 12 months? Last Year, the average rental price was 13 USD per day. The car rental companies available in Sicily are: Green Motion, Maggiore, Os Car.